Now this is want you call a man vs. nature film! And a real merciless one too! This low-budget, under-appreciated (if forgotten) Australian gem is far from your typical excursion into horror with a melodramatic backdrop involving the couples’ martial problems, but the way the insightful story folds out you can’t deny that this isn’t one horrifying exercise when nature finally unleashes its devastating power with such an claustrophobic strangle hold. You might think the idea in this particular sub-genre would be hokey and overall, a campy b-grade animal feature, but here that’s not the case because there’s nothing cheap about the story and thrills, as it goes for some old fashion spookiness and slow grinding suspense, where we are asked to think about the couples’ careless actions towards nature and the environmental message. There’s a little bit more going on in the film’s material and visuals then you might think and it does play on your mind with it’s disorientating atmosphere. The story slowly delivers in spurts a heavy amount of unbearable suspense and startling images that have a real unnerving effect with its terribly, uncomfortable mood. The nagging couple here are very obnoxious and a long way from likable, but they aren’t suppose to be! The anger towards them is justified because they’re the villains of this piece and we continuously witness their lack of respect for the surroundings. What nature has in store for them is powerfully effective and we can’t help but be drawn into the brooding mystery of how its going to play out. The picturesque location for the film is simply exquisite with the sprawling beach line and flourishing vegetation and wildlife. The way it can suddenly turn aggressive and change appearance after only being peacefully luminous (such in the weather and environment) makes it incredibly eerie, as you don’t know what’s up coming next. What caught this development was the hypnotic cinematography (done in anamorphic widescreen) that brought the wildlife off the screen with it’s incredibly spacious execution and swift movement in following the couple around and great panning that captures all the small things. It has a semi-documentary feel about it. The foreboding sound effects of the nightlife really do have a strong impact on your senses with the jerky and high-pitch sensation eating away at you with such well placed tension and strange noises that won’t let you escape. Also the quiet moments, since the dialogue is rather sparse, builds up the harrowing situation they’re faced with. The hauntingly, charged score by Michael Carlos is just like a ticking time bomb waiting to explode with it’s imminent dread and the tight editing nicely keeps the film moving until it reaches boiling point in the third act with an ending that shocks. The screenplay by Everett De Roche (Patrick, Road Games, Harlequin & Razorback) is an intelligent look at the relationship between the carelessness of mankind and the suffering of nature, which it does takes its time in delivering justice. The plot’s focus on the couples’ marriage, which is on the rocks is an good companion piece with their inconsiderable intrusion on nature where they believe their own problems are more important and think less of their surroundings. The performances are astoundingly, realistic in their interactions by John Hargraves as the arrogantly, destructive Peter (who has a better connection with his dog) and Briony Behets as selfishly, close-minded Marcia. This is one stuck up couple you like to see crash and burn, and nature provides that wish. 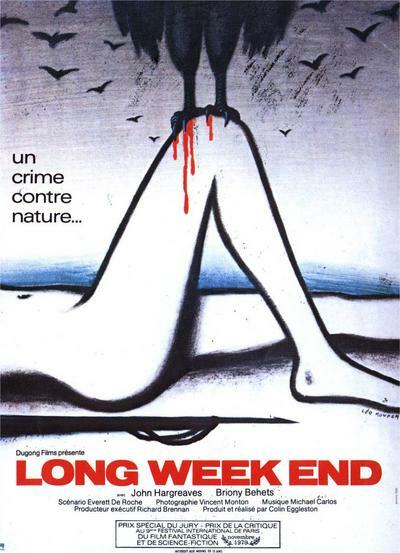 ‘Long Weekend’ is an sincere, atmospheric revenge tale with a ironically dour twist. It’s a very well made production that maximizes its chilling backdrop, petering tension and stimulating concept to send chills down your spine.